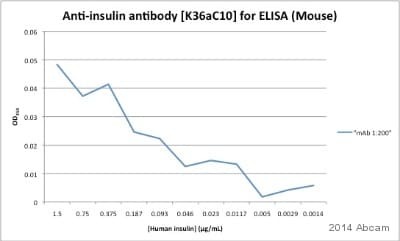 The antibody exhibits cross-reactivity with human proinsulin. This antibody recognizes purified insulin from the pancreas of human, bovine, horse, sheep, and proinsulin from human. 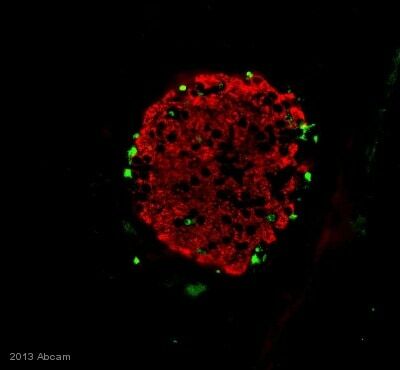 Cross reaction has been observed with insulin containing cells in fixed sections of pancreas from human, porcine, dog, rabbit, bovine, sheep, rat, guinea pig and cat. Our Abpromise guarantee covers the use of ab6995 in the following tested applications. IHC-P 1/1000. We suggest an incubation period of 30 minutes at room temperature. ab6995 staining Insulin in Mouse pancreas tissue sections by Immunohistochemistry (IHC-P - paraformaldehyde-fixed, paraffin-embedded sections). Tissue was fixed with paraformaldehyde and blocked with 10% serum for 45 minutes at 25°C; antigen retrieval was by heat mediation. Samples were incubated with primary antibody (1/1000 in PBS) for 1 hour at 37°C. An Alexa Fluor® 594-conjugated Goat anti-mouse IgG polyclonal (1/400) (ab150116) was used as the secondary antibody. 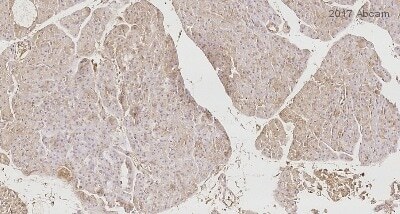 ab6995 at 1/1000 staining rat pancreas tissue sections by IHC-P. The tissue was formaldehyde fixed and blocked with BSA before incubation with the antibody for 16 hours at 4°C. An HRP conjugated goat anti-mouse antibody was used as the secondary. Publishing research using ab6995? Please let us know so that we can cite the reference in this datasheet. I have one further question: the product is sold per mL, what is the approximate concentration of antibodies per mL? I need to know how much ab6995 to add per mg of gel. Unpurified antibodies such as ab6995 will not have a concentration stated on the datasheet. An antibody concentration estimate of ascites fluid is 5 to 10 mg/ml. Thank you for contacting us. Because we carry over 100,000 products, it isn't feasible for us to keep small sample sizes of our products. Help us improve our service. Thanks for you email, Please let me know if you can provide FOC samples on the Anti-Insulin antibody [K36AC10]? Please let me know if you have antibodies suitable for immunohistochemistry of insulin in the pancreas of guinea pigs. https://www.abcam.com/index.html?datasheet=6995 (or use the following: https://www.abcam.com/index.html?datasheet=6995). 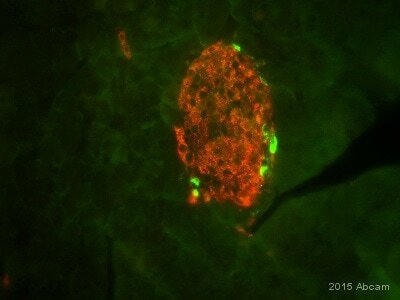 This antibody has been successfully tested in IHC-P and guinea pig and is therefore fully covered by our Abpromise. We have bought an Anti-insulin antibody [K36AC10] (ab6995). Would you be so kind to inform us in which startingdilution this antibody works in indirect ELISA and in dot-blotting? We do not have specific starting dilutions for ab6995 in ELISA and Dot Blot. These applications were added from publications that unfortunately do not exactly describe the dilution that were used. As a general recommendation for ascites antibodies, I can suggest to dilute the antibody 1/1000 for Dor Blot and 1/10000 for ELISA. I can also recommend to use two different dilutions for the first test experiment to be able to judge how to alter the dilution to optimize the results. I would like to encourage you to submit an Abreview about these two applications. We and other customers would value information about the dilution that was working for you and your samples and you would earn Abpoints that can be redeemed as discount on future orders or Amazon gift vouchers. I am sorry that I could not be of more help on this occasion and hope this information is nevertheless helpful.